Where is Bob? 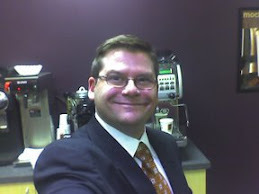 : Another 'BIGGBY WAY' Story -- Feathers in Cap! Ali and Theo were great, real teamwork and very hospitable, with connection issues, inventing a drink for me (skinny skinny Vanilla Chamomile latte--stressed out today!) and a toasted cookie (great idea, new to me) I even threw mixed currency and lotsa change at them and they were so nice all the while. I feel very valued. Feather their caps, please!! I like the sounds of a skinny skinny vanilla chamomile latte. Too late for BIGGBY BEAR contest, but that's not going to stop me from trying it! Hooray for Tea Lattes and toasty warm cookies--two of the most recent thoroughly beautiful BIGGBY innovations! Yummo! 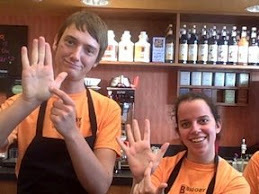 Nice job, Ali, Theo, and the rest of the Medical Mile BIGGBY crew! The person posting said "I feel very valued." This is core stuff here. It is the bedrock of good relationships. I've been married for more than a few years now and I can say that being valued is about as important for the relationship as anything else. What Ali and Theo have managed to convey to this customer is worth more than all the advertising that could be bought. Apologies to previous poster 105.7 in Grand Rapids.